I’m a huge fan of Garth Nix’s Old Kingdom trilogy. It may well be the best young adult fantasy trilogy ever written. So, as I pondered what to graciously accept as a mothers’ day gift (another book per year is totally worth the effort of giving birth), his latest book quickly won over the competition. I noticed the dedication in passing – two people involved in the production of a video game based on the book. Nix isn’t the first writer to have video game connections, and I thought nothing of it at first. 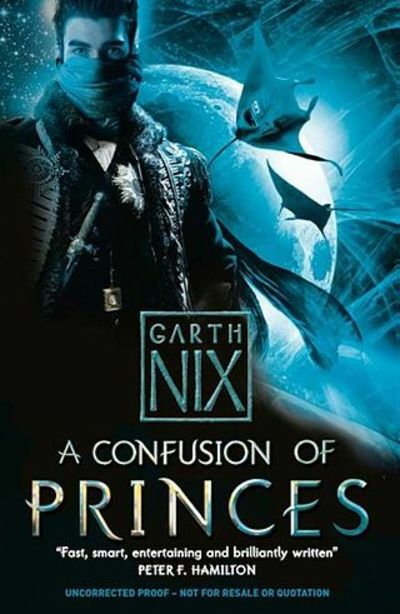 A Confusion of Princes is scifi. Prince Khemri was taken from his parents as a toddler and raised to be superior to other humans – and he certainly believes it. He’s downright peeved that it turns out the Empire is brimming over with princes and most of them are trying to kill each other (carefully, so they don’t get caught). The “world” of the story is nice and simple – there are three main kinds of talent (mechanical, biological, and psychic) and a mix of aliens and humans. It didn’t take long, however, before I felt like I was reading a Warhammer novel. Barren industrial-type corridors; alien incursions in said corridors; an awareness of strength and status in three clearly demarcated but equally important areas. . . you even die and come back to life again (if the Empire considers you worthy). I didn’t hate the book for reminding me so much of a video game (which is not a good sign since I don’t actually play video games myself, so the signs had to be pretty obvious) but the thin characterization and the arbitrary feel of the plot were significant flaws. I still didn’t hate the book, but I don’t recommend it. %%I have died three times, and three times been reborn, though I am not yet twenty in the old Earth years by which it is still the fashion to measure time. This is the story of my three deaths, and my life between. My name is Khemri, though this is not the name my parents gave me. I do not know who my parents are, and never will, for I was taken from them as a baby.